When I was in school, people called me and a friend “the Homerists” . . . And I was more and more convinced that, if one seeks the decisive categories of European thought (categories of “action” as well as categories of “knowledge”), one should go to Homer or Hesiod far more than Plato. . . . Unite [the Iliad and the Odyssey] and you obtain the fundamental outlines of Greek philosophy. Who was Homer? Let us set aside scholarly debates. All that matters is what the Ancients thought. For them, there was no doubt about the reality of the divine poet. Likewise, they never doubted his double paternity for the Iliad and the Odyssey.
. . . first we must be appreciate the fact that a work of this magnitude has survived 3,000 years. What veneration must have attended the work of the Poet, whatever the times, that this body of work survived the wars, vandalism, accidents, censors, ignorance! How many works of late Antiquity were lost while today we can read the Iliad and the Odyssey in their entirety! 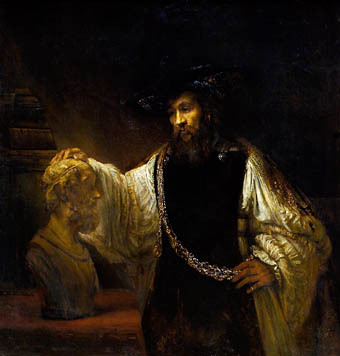 At the Library of Alexandria, Homer was the most-studied author; he was also the first to have a true critical edition. This critical edition began with Zenodotus of Ephesus in the first half of the 3rd century BCE and culminated with Aristarchus of Samothrace in the first half of the following century. . . . Beginning in the 2nd century BCE, the text becomes uniform. The work of the Alexandrian scholars had set a standard to which everyone referred from then on. The common source was the edition established in Athens in the 6th century at the request of Pisistratus. Although in the medieval West the bonds with the original texts of Homer were broken, the name of the Poet never ceased being venerated, and his heroes and their adventures were not forgotten. Homer indirectly continued to nourish the imagination of the Middle Ages through the traditional Latin poets like Virgil, Ovid, Statius, the Latin summaries of the Iliad, the apocryphal books of Dares the Phrygian and Dictys of Crete, the medieval romances like the Romance of Troy [of Benoît de Sainte-Maure] and their adaptations in prose . . . so that the heroes and subject of the epics were known to the educated public until the Renaissance, when the Iliad and the Odyssey were rediscovered in the original Greek.
. . . saw to the transmission of the old authors. The classical tradition was thus maintained in Byzantium where, from 425 to 1453, the schools of Constantinople remained its pillars. This is why it is unsuitable to speak about the “Renaissance” in the Eastern Roman Empire. In the West, on the other hand, the rediscovery of Homer was a striking fact for the first Italian humanists. At the request of Petrarch, who did not read Greek, the first Latin translation of Iliad was made in 1365–66. The decisive event was the fall of Constantinople in 1453. Shortly before, many learned Byzantines had taken refuge in Italy. Thus in Florence in 1488 the first edition in Greek of the Iliad and the Odyssey appeared. The first French translation of the Iliad was done in 1577 by Breyer. In these poems circulates the sap of eternal youth. They are the source of our literature and an important part of our imagination. At first, their prodigiously inventive style can seem a little disconcerting, with the repetitive descriptions that were used as reference marks by the ancient listeners. But once you get into the text, you become enchanted by it. 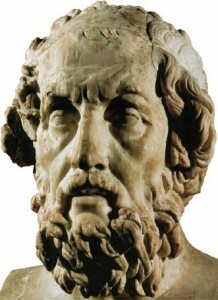 By composing the Iliad, Homer became the creator of the very first tragic epic, and with the Odyssey that of the very first novel. Both poems place the individuality of the characters in the center of the story, something one does not find in the tradition of any other civilization. As André Bonnard emphasized, the Iliad is a world populated by innumerable distinct characters. To bring them to life, Homer does not describe them. It is enough for him to lend them a gesture or a word. Hundreds of warriors die in the Iliad, but with a specific trait, the Poet gives them a singular life at the instant of death: “And Diores fell into dust, on his back, his arms reaching out towards his comrades” (IV, 565). Just one gesture, and today were are touched by this unknown Diores and his love of life. Death comes to the Trojan Harpalion, a brave man who cannot control a movement of horror: “Turning back, he rejoined the group of his comrades, looking around, so that bronze might not strike his flesh.” He fell back in the arms of his companions and, on the ground, his body expressed its outrage while twisting “like a worm” (XIII, 654). A single combat, a duel, followed, full of fire, between Ajax and Hector who, after many assaults, was wounded in the neck. “The spear made black blood ooze.” As the night fell, the heralds intervened to separate the two combatants. Homer shows us the point where combat answers to chivalrous rules. The two adversaries agree to suspend the fight until the following day, each returning to his camp, even exchanging their weapons (VII, 303–5). However stubborn, Ajax agrees, feeling that he has triumphed in this duel. Different is the bravery of the young Diomedes. He has the ardor and dash of youth. He is the youngest of the heroes of the Iliad after Achilles. He is never tired. After a hard day of combat, he still volunteered for a perilous night expedition to the Trojan camp, in the company of Ulysses, a warrior as brave as he is crafty and circumspect. Then brave Diomedes was seized with joy, and, planting his lance in the nourishing earth, he addressed his noble adversary these words full of friendship: “In truth, you are a patron of my father’s house, and our bonds are very old. . . . By your father and mine, let us be from now on be friends.” Thus spoke Diomedes . . . . Upon this, the two warriors jumped from their chariots, clasped hands, and agreed to be friends (VI, 229). Homer honors rooted individuality, not “individualism,” which is its perversion. With the respect of the adversary, in spite of implacable combat, they are bases of our tradition. One finds traces of this in the modern Iliad, Ernst Jünger’s In Storms of Steel. These living roots dominate the whole European psyche: tragedy and philosophy. They are engraved into art beginning with Greek sculpture; they sustain law and political institutions. 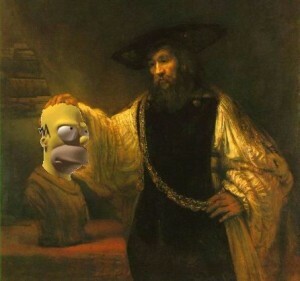 Homer does not conceptualize, as philosophers later did. He makes visible; he shows living examples, teaching the qualities that make a man a “kalos k’agathos,” noble and accomplished. “Always be the best,” Peleus told his son Achilles, “better than the rest” (Iliad, VI, 208). To be noble and brave for a man, to be gentle, loving, and faithful for a woman. The Poet bequeathed a digest of what Greece offered thereafter to posterity: nature as model, the striving towards beauty, the creative force that strives always to surpass, excellence as the ideal of life. The Iliad is not just a poem about the Trojan war, it is a poem about destiny as perceived by our Borean ancestors, whether they are Greek, Celtic, German, Slavic, or Latin. The Poet tells of nobility in the face of the plague of war. He tells of the courage of heroes who kill and die. He tells of the sacrifice of defenders of their fatherland, the sorrow of the women, the farewell of a father to his son going forth, the despondency of the old men. He tells of many more things still: the ambition of the leaders, their vanity, their quarrels. He tells also of their bravery and cowardice, their friendship, their love and tenderness. He tells of the thirst for glory that raises men to the level of gods. This poem where death reigns tells of the love of life and of honor placed higher than life, to which they were devoted even more than the gods. In 16,000 verses in 24 books, the Poet reports a brief episode at the end of the ten year siege of Troy, probably in the 13th century BCE. Troy, also called Illion (hence Iliad) was a powerful fortified city built at the entrance to the Dardanalles on the Asiatic side of the Hellespont, the enduring frontier between West and East. Like modern historians, the ancients Herodotus and Thucydides, did not doubt the reality of the events that provided the framework of the Iliad. The Trojans were Boreans (Europeans), the same race as their Greek adversaries, the Acheans “with the blonde hair,” also called Argives (originating in the Argolide) or Danaen (descendants of the mythical Danaos). Despite this small difference, the Trojans are associated with Asia, and not only for geographical reasons. Their army contained contingents of barbarians (foreigners to the Greek world), which was confirmed by archaeological discoveries in the 20th century of their relations with the very diverse Hittite empire. François Jullien, interview with Thierry Marchaisse, Penser d’un dehors (la Chine). Entretiens d’Extrême-Occident, November 2000, p. 47. Philosopher and sinologist François Julien is professor at the University of Paris-7. He is member of the Academic Institute of France and director of the Institute of Contemporary Thought. In order to discover the authentic nature of European thought, he compared it with something completely different, that of China, which had developed in an autonomous way, without any connection with the Indo-European languages. Jacqueline de Romilly, Homère (Que Sais-je?) (Paris: PUF, 1985). The BNF exposition “Homère. Sur les traces d’Ulysse” [Homer: On the Trail of Ulysses] was accompanied by an excellent catalog published by Seuil, realized by its three organizers, Olivier Estiez, Mathilde Jamain, and Patrick Morantin. No French translation is really satisfactory. To soak up the Iliad, one should refer to the translation of Paul Mazon (Gallimard, Folio Traditional), to which the Foreword of P. Vidal-Naquet adds nothing. For the Odyssey, one should especially refer to the poetic translation of Philippe Jaccottet (La Découverte, 1982, Poche 2004). The Bouquin collection, Homère. L’Iliade et l’Odyssée [Homer: the Iliad and the Odyssey], translated by Louis Bardollet, includes a useful critical apparatus. One can also profit from the essay by Jacqueline de Romilly, Hector (Editions de Fallois, Livre de Poche, 1997). One should also consult Marcel Conche, Essais sur Homère (PUF, 1999). Finally, see Dominique Venner, Histoire et tradition des Européens [History and Traditions of Europe] (Le Rocher, 2004), chs. 4–6. The neologism “Borean” has a broader sense than “Indo-European,” which is a linguistic category. It refers to the Greek myth of Hyperborean origins. The founding poems also conceal the first expression of historical thought. At the beginning of The Peloponnesian War, Thucydides refers to the Iliad to paint in broad strokes the ancient history of the Greeks, thus recognizing that Homer laid the foundations. But this merit was seldom recognized by others. Inspired by the gods and poetry, which are all the same, Homer bequeathed to us the hidden source of our tradition, the Greek expression of all the whole Indo-European heritage, Celtic, Slavic, or Scandinavian, with a clarity and formal perfection without equivalent. This is why Georges Dumézil read the whole Iliad every year.